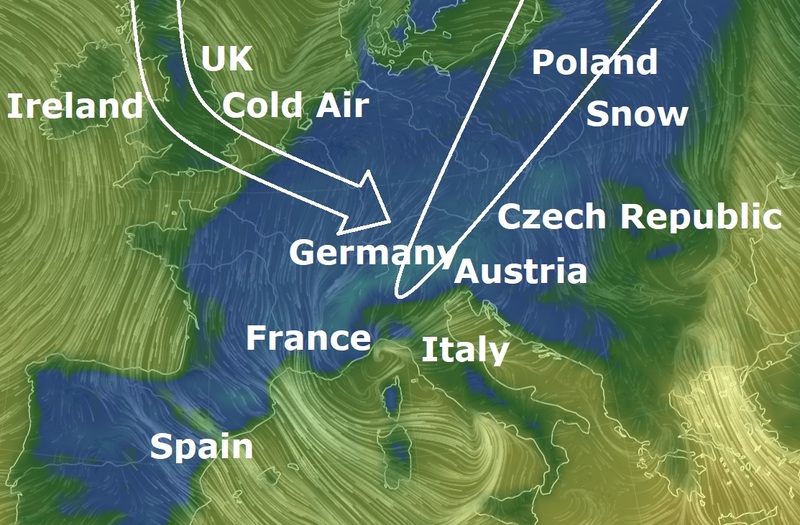 The coldest air of the season so far will descend on Germany this week, setting the stage for low-elevation snowfall. Winter coats will be needed throughout the entire country this week as high temperatures tumble several degrees below normal by Thursday and Friday. Normal high temperatures across Germany in late November range from 5-6 C (41-42 F). Temperatures will begin to tumble on Wednesday, with high temperatures ranging between 3 and 6 C (38 and 42 F) throughout the country. By Friday afternoon, temperatures will only be able to climb to 1-3 C (34-38 F) across much of Germany, with some locations struggling to reach 0 C (32 F). “Limited sunshine and occasional gusty winds this week will also make it feel even colder,” said AccuWeather Meteorologist Faith Eherts.